The Solipsist: A Little Chamber Music Will Do You No Harm . . .
but if you overdo chamber music, a physical dependency ensues with symptoms that include your acquiring precious speech patterns and becoming a pretentious dickhead socially. This is a problem rampant among New Yorkers. With chamber music, as with all things pleasurable in this world, moderation is in order. On the 15th at 5:00 p.m., I took in some very enjoyable chamber music at Belles Artes. There is a little auditorium there off the second floor promenade that I had not been in. Auditorio Miguel Malo. It is a comfortable little venue. 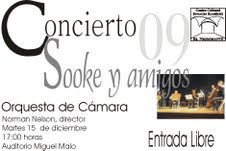 The group performing was billed as Sooke y amigos. It was a chamber orchestra, an adjunct of the Sooke Philharmonic Orchestra, conducted by a truly charming old Irishman named Norman Nelson. I was stuck by the first and second violins. I cannot tell you the names of this lady and this young man because the program does list the violins by seats, but I liked these two a lot. No grimaces. No postural histrionics. No showboating at all. Rather, they planted their asses in those seats and did nothing but straight ahead, hard driving violin playing. A tip of the hat to them. I am impatient with violinists who must signal me with a lot of bobbing and weaving that they are playing a helluva violin. I will be the judge of that based solely on the sound coming out of the thing. Nothing extraordinary about the program generally. Some Mozart. Some Handel. Some Bach. Some Haydn. One piece stuck out for me, however, because I happened to be unfamiliar with the work of the composer, Benjamin Britten (1913-1976), although I had certainly heard of him. Simple Symphony for Strings. Nice piece indeed. The Bach piece and the Haydn piece featured a flute. A lady named Alison Crone stepped on stage for these performances and burned up that damned flute. I do not know what the connection is between Vancouver and San Miguel. There is some sort of direct pipeline between the two cities. I have met an extraordinary number of people here from Vancouver. Strange it is. Anyway, Sooke is a tiny town on the far south end of Vancouver Island, just a little hop from Vancouver. So once again, go figure. And guess what this high end, two-hour concert cost me. Go ahead. Guess. . . . That's right. Nothing. Nada. I may be an old punk but I love chamber music and full orchestra too. Never understood people who restrict their enjoyment to only rock or only big band or only opera or whatever. Their loss. Benjamin Britten - English conductor, composer, violist and pianist. Died 1976. Perticularly well known for choral music, if I am not entirely mistaken. Zion Lutheran has performed some of his stuff. Chamber music is wonderful. I love it because it makes you so acutely aware of the interplay of the instruments.